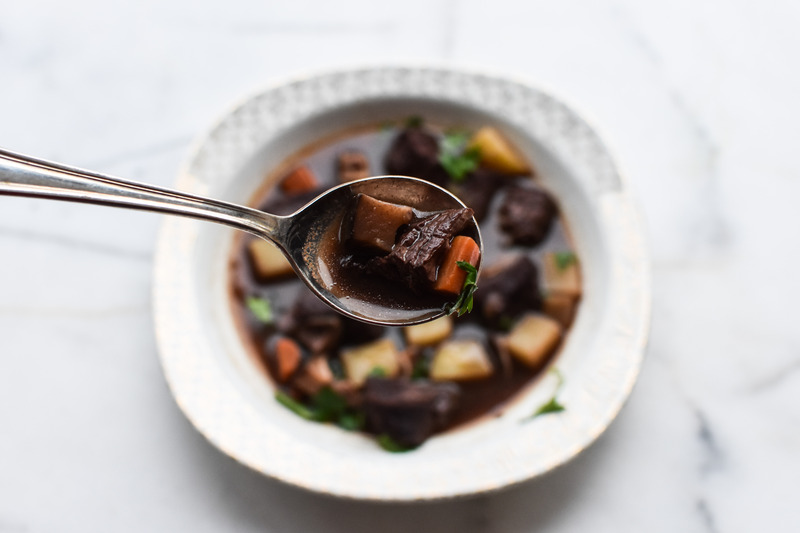 Author note: This stew is freezer friendly. 30 minutes before cook time, remove the stew meat from the fridge and bring to room temperature. Pat the stew meat dry and evenly distribute the salt and flour on the meat. In a large dutch oven (or a heavy bottom pan) heat the oil on high. Brown the meat, about 2 minutes per side, for a total of 4 minutes. Set aside. Turn the heat to medium. Remove the dutch oven from the heat, add the tomato paste, onions and carrots. Stir well and with a wooden spoon scrape up any bits that have begun to stick to the bottom of the pan. Place the pan back on the heat and cook until the vegetables have softened and the paste has browned. Stir frequently to prevent burning the paste. Add the red wine, deglaze the pan and bring to a boil. Add the beef stock, thyme, bay leaves and salt pork and bring to a boil. Reduce the heat to medium low and let the stew simmer for 2 hours, or until the meat is tender. Once the beef is easily pierced with a fork, add 1 cup of water and increase the heat to a heavier simmer. Add the potatoes and mushrooms. Cook until the potatoes are soft. Salt to taste. Serve warm with crusty bread and a glass of dry red wine. This entry was tagged A Pleasant Little Kitchen and The Dallas Morning News, beef stew, dallas food blog, dallas food blogger, good food blog, good stew recipe, red wine beef stew, red wine beef stew recipe, red wine stew, soup recipes, texas food blog, texas food blogger. Bookmark the permalink.